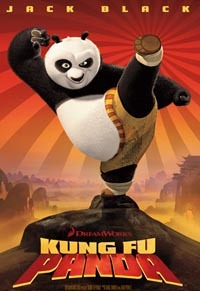 In Kung Fu Panda, funny man Jack Black lends his voice to a big, tubby Panda named Po who works in a noodle restaurant owned by his father (which is a goose by the way) but dreams of becoming a Kung Fu master. One fateful day, Master Oogway, the great and wise tortoise, predicted that the evil snow leopard Tai Lung would escape from prison and wreak havoc into the village. Master Shifu, the Kung Fu master, was alarmed and immediately sent his messenger to go to the prison. After Shifu heard the news, he instantly gathered the Furious Five; Tigress, Crane, Monkey, Viper and Mantis and announced to the whole valley that they will be choosing the Dragon Warrior which they believed was the only one who could defeat Tai Lung. When Po heard this news, he hurried up the steps going to the temple with great difficulty just so he can watch who among his heroes, the Furious Five, would be chosen. In a twist of hilarious fate, Po was the one chosen by Oogway to be the Dragon Warrior. Much to his delight, Po tried his very best to train but to no avail particularly since Shifu and the Furious Five wants him gone. When Oogway passed away, Shifu had no other choice but to accept Po and train him. In the end, Po finally learned Kung Fu through food techniques and was victorious in defeating Tai Lung. This movie had me laughing from start to finish and I definitely recommend it to anyone who needs a little perk me up.